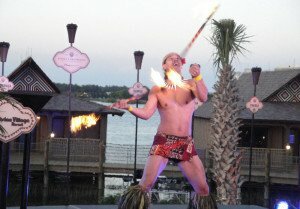 This week’s top news is the grand opening of Disney’s Polynesian Villas & Bungalows, plus the latest on Miami Rum Renaissance Festival and Cocktail Week. Also noted are The Hukilau’s 2015 mug, and the death of Polynesian performer Ernie Menehune. 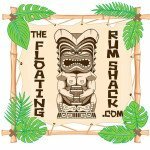 Weekly features spotlight artist Thor, website The Floating Rum Shack, exotica pioneer Martin Denny, and Tucson’s Kon Tiki. 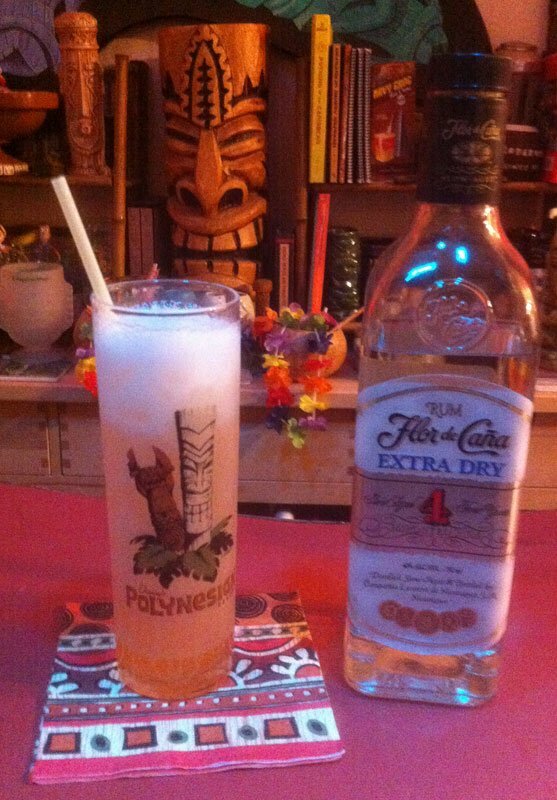 The rum of the week, Flor de Caña white, is featured in the Pieces of Eight cocktail. Disney’s Polynesian Village, one of the Orlando resort’s original flagship hotels, has unveiled an expansive two-year renovation designed to lure visitors with lavish new rooms, refreshed lobby and pools, and an interactive Tiki-themed lounge. April 1 was the grand opening of Disney’s Polynesian Villas & Bungalows, the latest Disney Vacation Club (DVC) addition to the sprawling Disney World property. 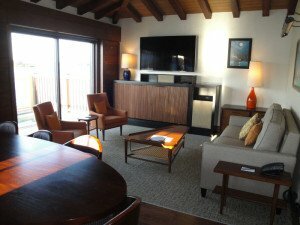 The 360 deluxe studio rooms are being added to the 39-acre resort’s 11 existing South Seas themed longhouse buildings, while the 20 bungalows were built over the water on Seven Seas Lagoon with scenic views of the Magic Kingdom. Disney held a media preview event on March 31, with tours of all the new additions as well as a grand-opening ceremony that included a torch-lighting and traditional fire-dancing by a performer from the resort’s Spirit of Aloha dinner show. Ken Potrock, the executive who oversees Disney Vacation Club, called the Polynesian “the third jewel in our monorail crown,” joining the nearby villas at the Grand Floridian and Bay Lake Tower at the Contemporary Resort. The Bora Bora Bungalows are the most spectacular addition, providing a unique and luxurious experience for guests. With two bedrooms, two baths and full kitchen, these freestanding huts inspired by traditional Polynesian structures sleep up to eight guests. Despite the stylistic similarities, these are not primitive accommodations. Disney’s bungalows include three giant flat-screen TVs, a TV embedded in the master bathroom’s mirror, a surround-sound entertainment system featuring invisible speakers in the wall, a washer and dryer, and many artistic touches that harken back to the history of Disney and the Polynesian Village. Each bungalow features 1,300 square feet indoors and another 300 on a deck that includes a plunge pool, chaise longues, and two hanging basket chairs. “The view outside the bungalows is absolutely breathtaking,” said Norm Noble, the resort’s general manager. Guests can sit back and relax while the nightly Electrical Water Pageant passes by, then watch the Magic Kingdom fireworks show with sound pumped in via dedicated speakers. Kyle Barnes, the art director who oversaw the entire Polynesian refurbishment, said he and other Disney Imagineers went back to the resort’s original concept art for inspiration. 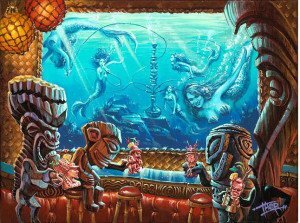 “A lot of our Disney legends had beautiful renderings,” he said, and many of them turn up in the bungalows and Trader Sam’s Grog Grotto, the new bar and lounge that’s more of an attraction similar to the Jungle Cruise or Enchanted Tiki Room than a drinking and dining establishment. Amid the opening-day hoopla, renovations were still in progress. The resort’s main pool with its large volcano water slide opened later in the week. The third of three longhouses containing deluxe studio rooms will not be done until July, and the smaller pool for the DVC buildings will soon close for renovation through the end of the year. The vacation club is essentially Disney’s version of a time-share with members buying points to stay at DVC resorts in Orlando, Vero Beach, Hawaii and elsewhere. They can also use points to stay at non-Disney destinations. At Disney World, DVC rooms are available to rent as regular hotel rooms when they’re not filled by DVC members. Rum industry VIPs from more than 30 countries will soon be jetting into South Florida for the seventh annual Miami Rum Renaissance Festival and its accompanying Miami Rum Fest Cocktail Week. The festival, featuring dozens of new rum brands in addition to the classics we all know and love, will be held April 17-19 at the Doubletree by Hilton Miami Airport Convention Center. The highlight of the festival and industry trade expo is the grand tasting events for consumers and members of the spirits industry. More than 100 rums will be available for sampling. New brands from South Florida, Georgia, Antigua, Barbados, Grenada, Haiti, Jamaica, Panama, St. Vincent, Trinidad, Guyana, Suriname, Austria, Denmark, Japan, Philippines and India will all make their U.S. debut at the festival. 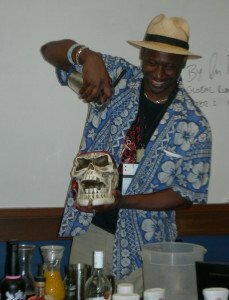 Billed as largest rum festival in the world, the event will also feature celebrity seminars, live entertainment, island lifestyle vendors and interactive cocktail demonstrations. It’s a unique opportunity for enthusiasts to meet and mingle with rum experts and professionals in a casual setting. One-day general admission tickets are $50, two-day VIP passes are $75, and three-day VIP passes are $100. Tickets must be purchased in advance as there will be no sales at the door this year. Rooms at the Doubletree are sold out, but there are still rooms available at host hotels on Miami Beach. Coming soon: A full preview of the seminars and all the new rums coming to Miami Rum Renaissance Festival. 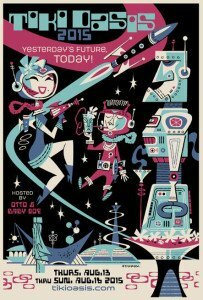 Cocktail Week kicks off Tuesday (April 14) with the annual Tiki night at The Mai-Kai in Fort Lauderdale. Festivalgoers will gather in the 57-year-old landmark’s Molokai bar for its famous tropical drinks, then a group dinner seating in the spectacular showroom for the famous Polynesian Islander Review. A new rum, Fwaygo from Fort Lauderdale, will be featured in a special complimentary cocktail. Rum Fest guests must RSVP in advance by calling the restaurant at (954) 563-3272. The festival is also offering a round-trip bus trip from the Doubletree for $25. Other nightly Cocktail Week events will be held Wednesday at The Regent Cocktail Club (Miami Beach), Thursday at The Broken Shaker (Miami Beach), Friday at the Shops at Mary Brickell Village (downtown Miami), Saturday at Ball & Chain (Calle Ocho), and Sunday at The Rum Line (Miami Beach). The Hukilau’s 2015 mug by Tiki Diablo. 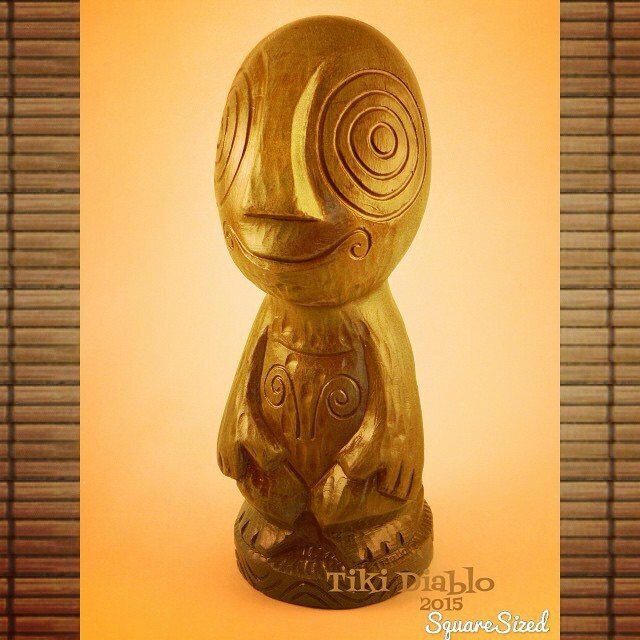 The Hukilau has released a photo of the official 2015 event mug by Tiki Diablo. It will be available soon featuring four different glazes, 100 mugs per glaze. It was inspired and adapted from a design by artist Dave “Basement Kahuna” Wolfe. For more info, follow The Hukilau on Facebook and/or go to TheHukilau.com and sign up for the e-mail list. Polynesian singer and performer Ernie Menehune – a headliner on the mid-century supper-club circuit in Las Vegas, Reno and Lake Tahoe who continued to perform into his 90s – has died at age 92. His death came a week after being diagnosed on March 19 with cancer. 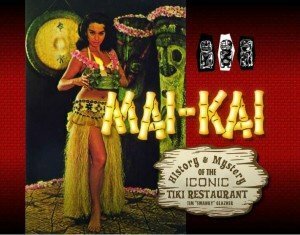 A native of Hawaii, Menehune moved to Arizona in the early 1960s and was a regular at Tucson’s iconic Kon Tiki restaurant for decades. He also built his own island paradise, the 5-acre Menehune Ranch, were he regularly held luaus. “Hookah Lou Bubble Bar,” Thor’s tribute to The Hukilau 2007 and The Wreck Bar in Fort Lauderdale. 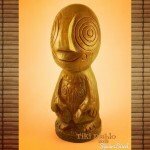 The Tiki figures are holding mugs that depict artists Crazy Al Evans (left), Bamboo Ben, Squid, and Gecko. Tom “Thor” Thordrson, a longtime artist in the theme park and entertainment industry, also creates some of the most distinctive modern Tiki artwork. After working as a Disney Imagineer, then pursing his art career in Hawaii, Thordrson now works for BRC Imagination Arts in Burbank. But he continues to produce his vivid, richly detailed paintings of exotic locales that have become a favorite of collectors. His colorful work has been featured in private and public collections around the country, including suites in Disney’s Polynesian Village Resort. These U.K. bloggers and rum enthusiasts live up to their promise to explore strange new cocktails, seek out new rum and new civilized places to drink, and to boldly go to the places that rum is produced. Their award-winning blog features the latest news, reviews, and live coverage of many of the world’s top rum events, including Miami Rum Renaissance Festival. It’s a great spot to find no-nonsense rum industry coverage by big fans of the spirit with no vested interest . 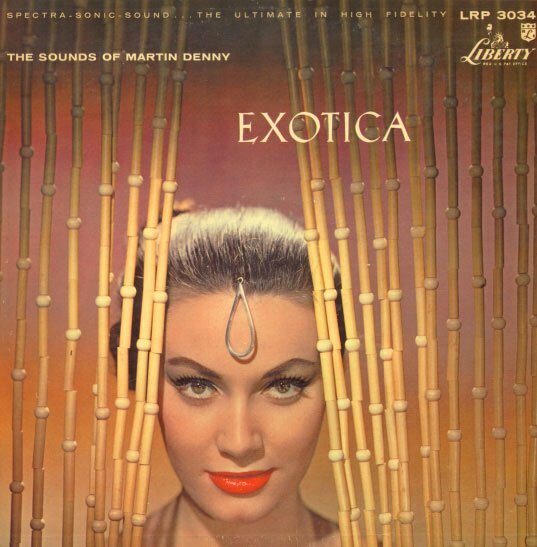 Considered the father of exotica music, Martin Denny (1911-2005) was a piano player, composer and bandleader whose seminal albums in the 1950s and ’60s created a template that’s still being followed by modern revivalists more than 60 years later. Unlike today’s niche market, Denny’s unique combination of jazz, Latin and lounge was massively popular during the mid-century. 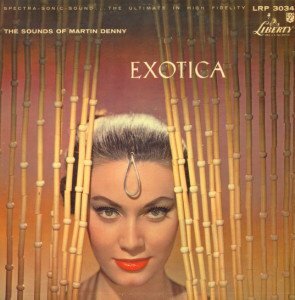 His first album, Exotica (1957), not only inspired the name of the genre, it reached No. 2 on Billboard’s charts. Denny’s tour de force, Quiet Village, topped the singles chart and remains perhaps exotica’s most famous song. In the early days, his band was a fixture in Hawaii, where they stumbled upon exotica’s unique contribution to popluar music. After playing an outdoor gig that was overwhelmed by croaking frogs, Denny’s bandmates began performing tropical bird calls, originally as a joke. Added to Quiet Village, the frogs and birds became a distinctive exotic touch in the music of Denny and everyone who followed in his footsteps. This Tucson, Ariz., institution opened in 1963 and remains one of the classic examples of a mid-century Polynesian restaurant and lounge. It has changed little in more than 50 years, with lots of Tikis and vintage light fixtures surrounded by plenty of bamboo and thatch. In its early days, the Kon Tiki was home to not only exotic fare and decor, but animals such as parrots and lizards. In recent years, it has been adopted as a regular hangout by a different type of wildlife: local college students. So try to visit during non-peak times if you’re looking for an authentic experience along with decent Polynesian food and drinks. After falling into disrepair, the signature torches atop the classic Kon Tiki sign out front were re-ignited during a 2010 ceremony and celebration that drew Tiki fans from near and far. 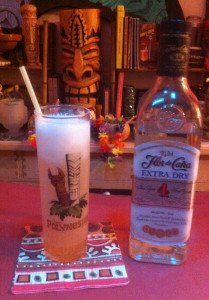 Nicaragua’s Flor de Caña, a distillery that dates back to the 1890s, produces an excellent Spanish-style white rum that can substitute for any Cuban, Puerto Rican or Virgin Islands rum in classic Tiki cocktails. Aged four years, Flor de Caña Extra Dry is dry and fruity but perfectly balanced with hints of sweetness and vanilla. As an aged white rum, it’s a step above 90 percent of the low-priced white rums, but not a whole lot more expensive. It fills a niche between the bland, standard white rums and the more bold aged rums. It’s perfect for complex cocktails that need a good base white rum that’s high quality, but not too assertive. Note: Extra Dry was recently replaced with a 4-year-old white called Extra Seco that appears to be essentially the same product with a new label. Pulse blend with 1/2 cup crushed ice for several seconds, then pour into a tall glass. Add more crushed ice to fill. This tart and refreshing classic – unearthed by Jeff “Beachbum” Berry from the long-gone Pieces of Eight restaurant in Marina Del Rey, Calif., circa 1972 – is elegant in its simplicity and goes down very easy. While some Tiki drinks assault you with a dozen ingredients, this one is much easier to make, but in no way is it one-note. The sour/sweet/strong ratio is perfect, with a nice balance between the passion fruit and white rum. The key is to use a simple yet assertive Spanish style rum such as Flor de Caña, plus a quality passion fruit syrup. Among those we recommend are B.G. Reynolds, Fee Brothers, and Monin. It’s also easy to make a great homemade syrup using frozen passion fruit pulp and organic sugar. 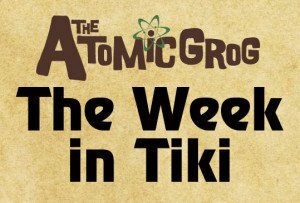 * May 15-17 – Vintage Tiki Weekend at the Caribbean Motel, Wildwood, N.J. 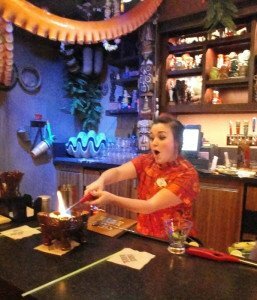 This entry was posted in 2015, Art, Cocktails, Culture, Disney World, Events, Events, History, Hukilau, Mai-Kai, Music, Other Florida, Recipes, Resorts, Restaurants, Reviews, Reviews, Rum, Rum festivals, South Florida, The Week in Tiki and tagged Beachbum Berry, cocktails, Disney World, Disney's Polynesian Village Resort, Ernie Menehune, Floating Rum Shack, Flor De Cana, Hukilau, Ian Burrell, Kon Tiki, Mai-Kai, Martin Denny, Miami, Miami Beach, Miami Rum Festival Cocktail Week, Miami Rum Renaissance Festival, Pieces of Eight, Polynesian Resort, recipe, rum, South Florida, Tiki Diablo, Tom Thordrson, Trader Sam's, Trader Sam's Grog Grotto, Walt Disney World, Wreck Bar. Bookmark the permalink.